Hi everyone!! I have been home alone all week and have been so busy. Lexie went to Bible camp this week, so I thought I would have all this time to stamp...lol. Time flies! I did go to lunch with my mom though today and that was good. We don't do that often enough. This was the sketch challenge over on Splitcoast yesterday. I was working with the resist techniques since that is what we are doing at my next class and this is on of the backgrounds I made. 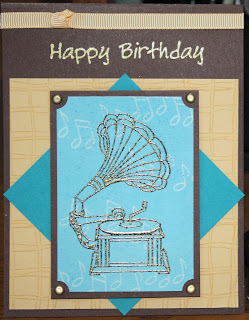 I stamped the music notes with versamark on glossy white cardstock, then brayered over it with Taken with Teal, polish it with a paper towel, then stamp the phonograph with versamark and embossed it with Patina Gold. I layered it on Choc Chip, then on the Taken with Teal. The layer on the base is So Saffron stamped with the Plaid background. The saying is stamped with versamark and embossed with Glow ep. I have a piece of knotted Saffron grosgrain ribbon at the top, stuck down with 1/4 double sided tape. All stamps are Sparkle n Sprinkle.